Read Vending Times All State Manufacturing. 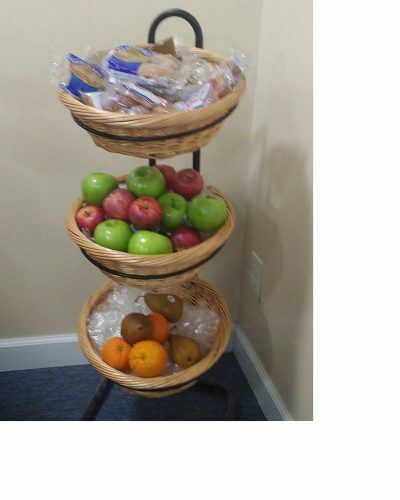 All State Mfg is excited to announce we now have customized signage available for tops of our customers micro market stands as well as three tiered basket sets. Signs and basket sets are both very reasonably priced. Our customer, Cater Time Vending, in Missouri set up this market using both and couldn’t be more pleased. 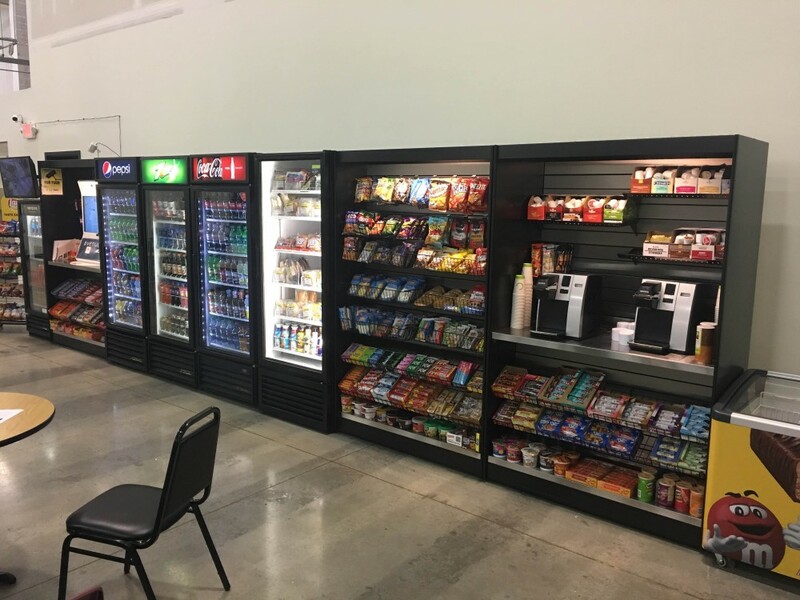 These new stands were developed using insight from a very progressive and proactive vending operator, Fox Canteen of Terre Haute, Indiana. 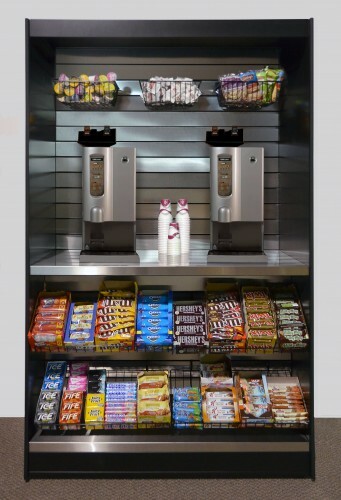 These units can be used for either a coffee station, pay station or for display. 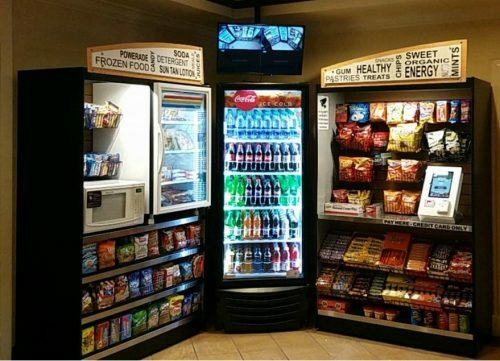 They have an LED light for better product display. The LED light shows your products off while using very little electricity. These are great stands for starting small. Maximize your Nano Market space and set up time with these fully assembled stands. Setting up the profitable stand alone Nano Market or Micro Market has never been easier. Call today. One happy customer’s comment about our stands. NEED 36 INCH STANDS? WE GOT YOUR BACK. MMS272 These stands at 27 inches wide are ideal for use as a pay station or coffee center. The LED light will enhance product viewing. A choice of slat wall look, it is available in stainless steel, vinyl-clad oak, or vinyl-clad walnut. Also a choice of black or platinum color on the inner walls. Lots of display space (12 square feet) in a stylish sturdy cabinet. Dimensions – 27 inches wide outside, 25.5 inches wide inside. 78 inches tall, with over 72 inches of vertical display area. 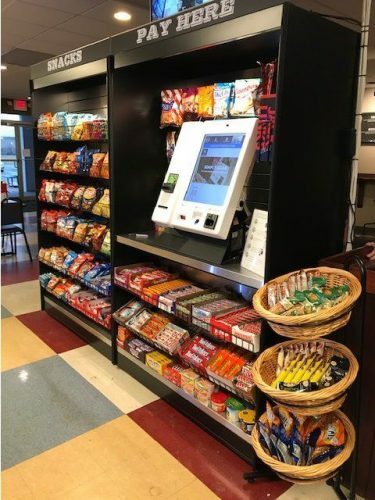 Both bottom and kiosk shelves are stainless steel. Leveling feet are included. One LED light is included. MMS271 This sleek new stand lets you put lots of products in your micromarket. If limited space is a concern this stand may be just what you need. Dimensions – 27 inches wide outside, 25.5 inches wide inside. 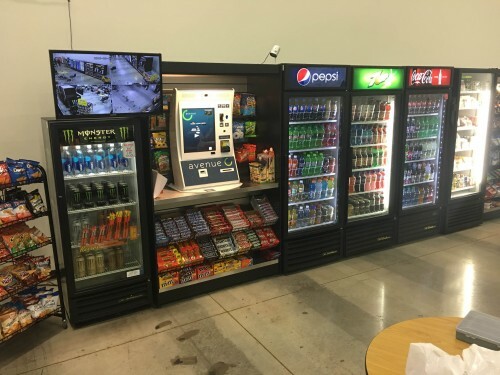 78 inches tall, with over 72 inches of vertical display area. Leveling feet are included. One LED light is included. The bottom shelf is stainless steel. MMS 492 Our newest stands are for the emerging micro-market. 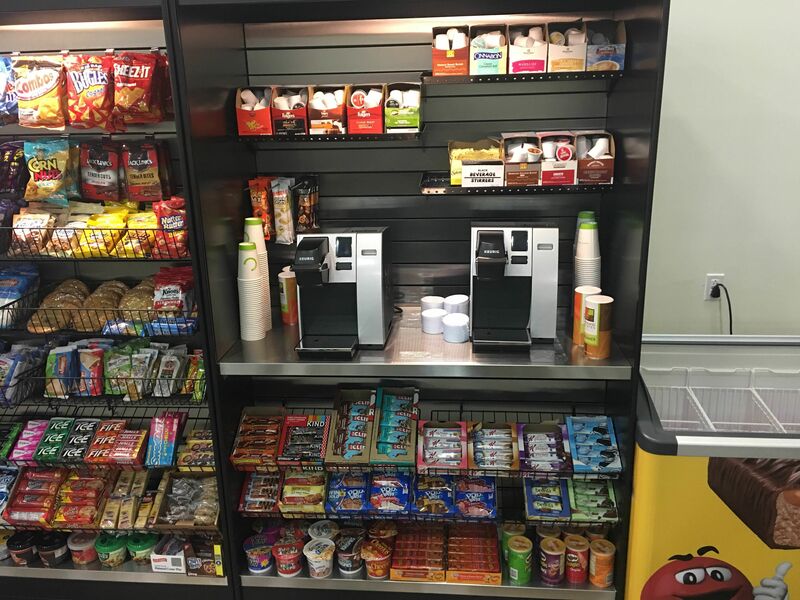 This unit can be used for either a coffee station as shown or as a pay station. It has an LED light for better product display with minimal use of electricity. The MMS 492 is built using our durable double-wall construction. Included is one LED light, 2 built in stainless shelves. Free Options include choice of black or platinum color on the inner walls, choice of oak, walnut, or stainless steel slats. Other upgrade options offered for your convenience are – An economical surge protector for electric, video, modems, with convenient 10 foot power cord. 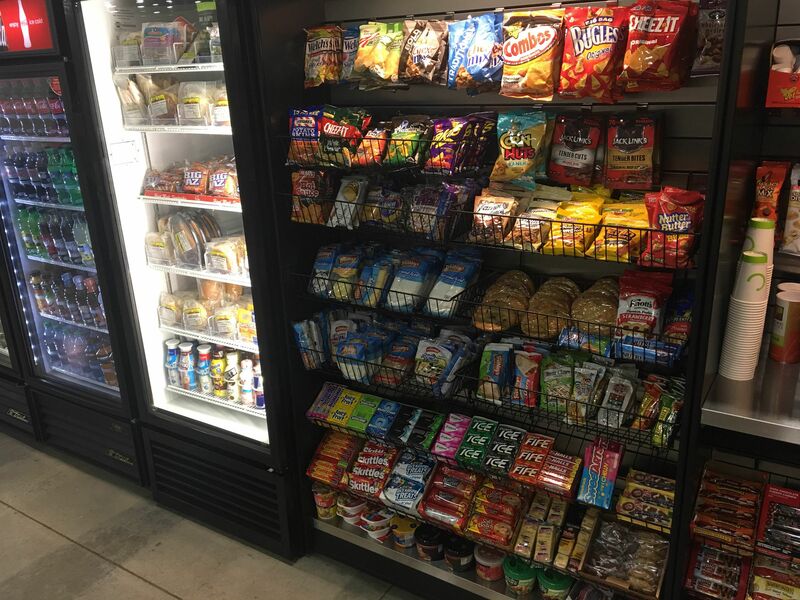 Display package upgrade includes 4 each 14 x 23 inch black wire slant shelves, 6 each 12 x 12 x 4 inch black wire baskets, and 10 each display pegs. Two uses one well built stand. MMS 491-DS-P Display stand for the busy micro market. This display stand holds many of those customer favorites. 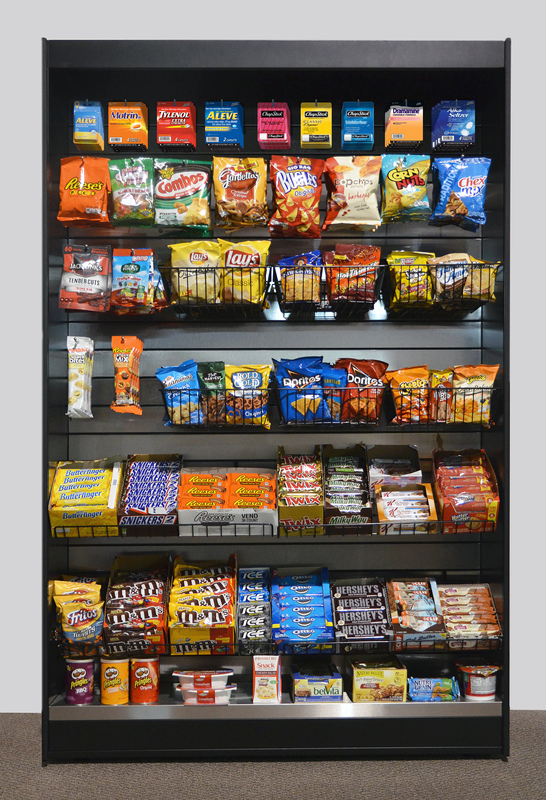 With a display area of over 23 square feet, there is room for numerous point of sale items. It has an LED light for better product display. The light output is a generous 475 lumens using only 10.5 watts of electricity. The MMS 491 is built using our durable double-wall construction. Other upgrade options offered for your convenience are – An economical surge protector for electric, video, modems, with convenient 10 foot power cord. Display package upgrade includes 4 each 14 Nx 23 inch black wire slant shelves, 6 each 12 x 12 x 4 inch black wire baskets, and 10 each display pegs.